Last year I saved seeds from an enormous shop-bought butternut squash and sowed them this spring. All the seeds germinated and have thrived in the veg bed after planting out. The plants are enormous and have produced a good collection of fruit. Some are rugby-ball sized, weighing 5 - 6 lbs, yellow with green stripes, or pale green with dark green stripes. Not a butternut squash to be seen! The commercial growers (in Italy or South Africa - can't remember) obviously used F1 seeds which are hybrids. The seeds are produced by carefully cross-pollinating two or more different varieties to produce squashes with desirable qualities. The seeds from the off-spring of F1 plants are rarely like their parents. 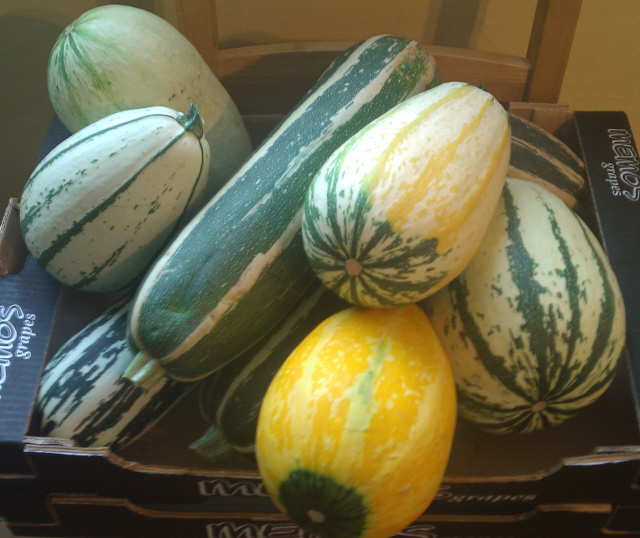 In our case they had obviously used a variety of squash bred for SIZE! Anyway our super-squashes are fairly tasty - yellow rather than orange-fleshed like a proper butternut squash - and have been roasted and made into soup. The small fruits can be used like courgettes - fried, baked, stuffed whatever.